The year 2017 sounds like more of a threat than a promise….but we’re not going to let that assuage us. We still look at the promise of new sounds and the greater good to carry us across this new threshold. There’s a lot of really (really) good new music coming out this month and next and we’ve got a sampling for you, including Hiss Golden Messenger, Chuck Prophet, Rhiannon Giddens, and local favorite David Luning. 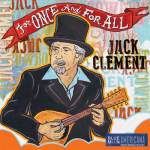 We’ll open things up this episode with a tip-of-the-hat to the great Jack Clement, renaissance man and a songwriter whose mark has been stamped indelibly on the Americana songbook. Looking forward to your presence! 31 J Shogren Shanghai'd Swampland Why So Blue Bird?